This is one in a series of blogs sharing 1st person accounts of clients of Kevin Smith Transportation Group sharing their experiences touring Pennsylvania Wineries. As the leading luxury transportation company in Pennsylvania, Kevin Smith Transportation Group offers a fleet of Stretch Limousines, Party Buses, and Executive Shuttles to make every wine tour the perfect experience for our clients. This blog is their story. Are you looking to book a wine tour in Pennsylvania? Whether the trip is a romantic getaway, a group of best friends celebrating a special event or a company outing, simply call KSTG today at 610-222-6225 and let one of our “Wine Sommeliers” arrange all of your transportation. From day trips to overnight excursions, let KSTG handle all of the driving so you can focus on tasting the amazing wines that Pennsylvania wineries have to offer. I was planning my wife’s 40th birthday party. We had talked about a lot of different ideas, including a trip to New York and to Atlantic City. Finally, we landed on doing a tour of some Pennsylvania wineries. We researched a lot of vineyards online but we landed on Crossing Vineyards and Winery. They were originally founded in 2000 by the Carroll Family. Apparently, the son had grown up on the estate and wanted to start a vineyard. The cool part was he started the business with his parents and in 2002, delivered their first wine. We read online that they had won all kinds of awards, including Best of Bucks County for 7 years in a row and best of Bucks Mont for 4 years. When we researched the winery, we saw they hosted a lot of special events. One of the events that stood out to us was a Summer Wine and Music Series. For only $15 a person, we gained access to the concert and was able to enjoy an amazing selection of wine and cheese assortments. This had our attention! 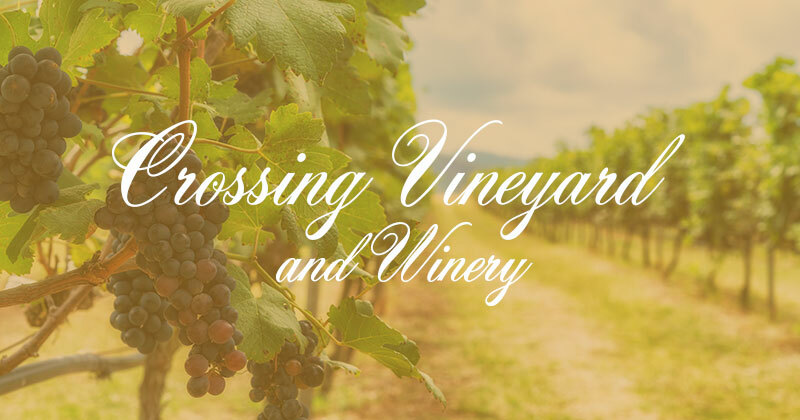 We ultimately decided to book a day trip to Crossing Vineyards and Winery. We worked with one of the Wine Tour experts at Kevin Smith Transportation Group who arranged an 18 passenger Party Bus. Along with us, we had 6 other couples who joined us. We all met at our house at 9am and loaded into the Party Bus. KSTG had arranged to have the Party Bus stocked with some light snacks and some adult beverages. We headed over to Crossing Vineyards and Winery and had an amazing wine tasting where we also had a picnic lunch afterward. The staff was amazing and the entire experience was awesome. The 4 hours went by fast but our day wasn’t over. On the way back home, we stopped off at one of our favorite spots and continued the fun. The entire day was simply perfect. While on our tour, we learned that they also host weddings. I can only imagine what a wedding would be like with the gorgeous vineyards and amazing fountain as a backdrop. I would imagine a sunset behind you while walking down the aisle would be a day to remember. We were told they can host weddings up to 175 people which probably covers most size weddings. The cool thing is they also hold weddings in the winery, where the setting is also intimate (max of 75 guests) and with the walls being lined with oak barrels, well the image is priceless. I had no idea all of the options that existed when it came to touring wineries. However, Crossing Vineyards and Winery more than exceeded our expectations and we look forward to returning in the near future…in a KSTG Party Bus maybe! Thank you for reading today’s blog on Pennsylvania Wineries. Please return every week as we provide 1st person accounts of tours of the Pennsylvania Wine scene. For more stories about Pennsylvania Wineries, visit our blog page. Also, check out the Ultimate Wine Tour guide for information on Pennsylvania’s more than 200 wineries.